Some time ago, I purchased five half yard cuts of some of my favorite Cotton + Steel prints from various collections that coordinated with each other. I didn’t have a plan for those fabrics when I bought them, but I knew that they’d be awesome together. Fast forward probably a year or two and I finally have those fabrics out of my stash and into a quilt! I sat down with my sketchbook and went through some old “waiting to be made” designs for inspiration. Then I realized that I could fussy cut the Viewmaster fabric to fit perfectly in the center of these blocks. I also love how the aqua print stands out in this design. It creates a great secondary design. Below is a close up photo of the quilt prior to quilting. I just love these colors together! I also love the tiny bits of silver dots on some of the aqua pieces (you can see some in the top left triangle). For the backing, I chose this cotton lawn print called Metropolis in navy. It is also by Cotton + Steel, feels SO soft and is a nice light weight. I had a few issues when I was quilting it on my Bernina though. For some reason, the lawn fabric wanted to shift a bit as I quilted, which made some of my quilting lines a bit wonky, but I can live with that. 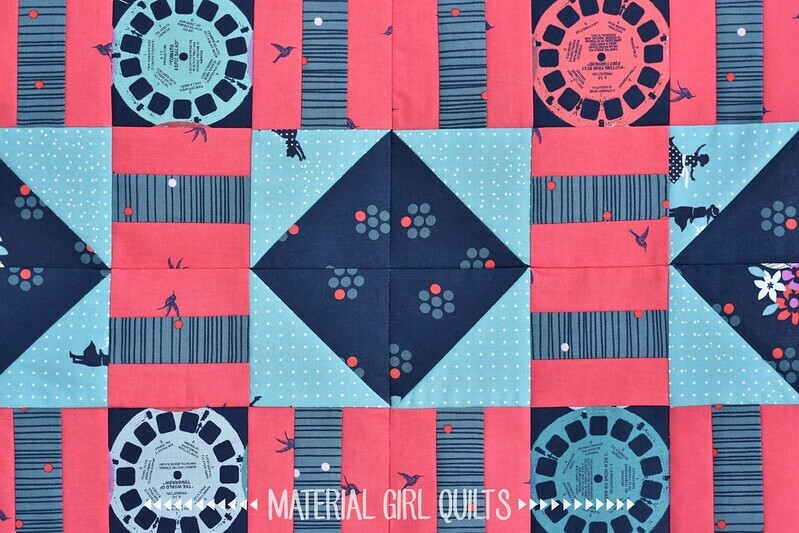 I kept the quilting simple by echoing 1/4″ inside the seams of the rows going vertical and horizontal. The quilt finishes at 36″ square, so each block measures 9″ finished. I think this is the perfect size baby quilt. You can throw it on the floor for a baby to get some tummy time and it’s big enough for a toddler to snuggle. 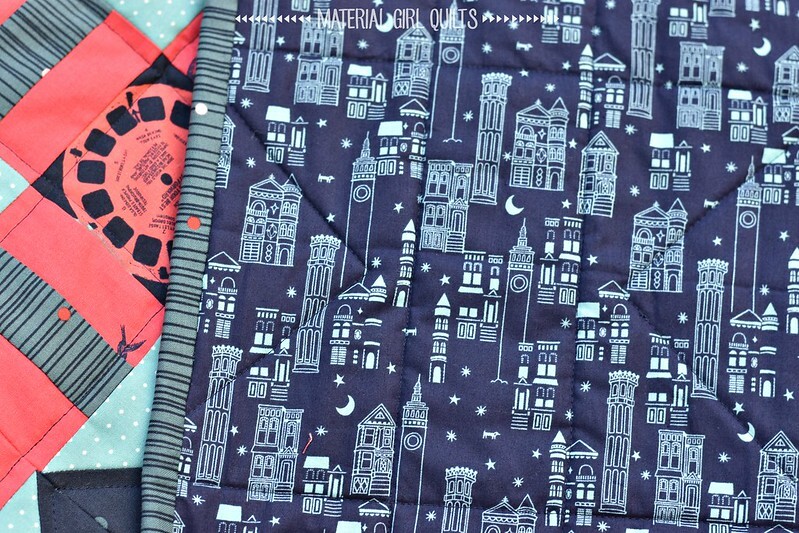 What is your favorite size baby quilt to make? Oh my gosh I just love it. I think I only have maybe a couple of FTQ’s of the main print I will have to dig it out and make a mini. Thanks for the inspiration. Another AWESOME creation Mandy!!! Love it! I have that same reel print and have been wondering how to use it. This is very clever! I used to make crib sized quilts, but it got too complicated trying to do the theme thing, so now my favorite size is 36-40″ square. They’re easily packed into a diaper bag, always in demand, and I can make them in whatever cute fabric I happen to have on hand. Plus, I make them in between my larger quilt projects so I always have a few on hand to gift quickly. Beautiful fabrics, beautiful quilt. I am enchanted by the blue birds and the dancing girls in the fabric.